» Review: Misaka Mikoto by Penguin Parade うぐぅ～! It’s a fairly neutral pose, with a challenging look to her face, which fits her character nicely. She’s holding one of her trademark arcade coins used for the railgun in her right hand; the coin actually came in a separate bag and I had to shove it between her fingers quite forcefully, but at least that means it won’t fall out too easily. 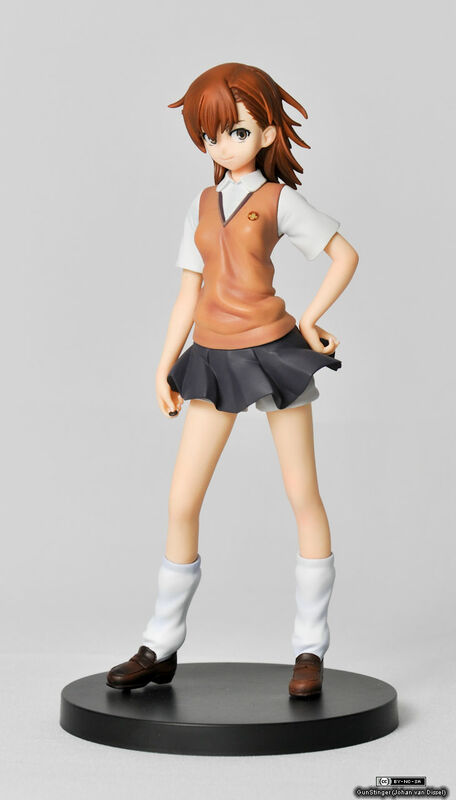 Ami Ami sold an exclusive version where she has her right hand raised and Misaka looking to the right, but other than that it’s the same figurine. You’ll notice her right foot is slightly of the ground. This is because for some reason, there’s a broken-off pin stuck in her foot. There’s 2 holes in each foot, and only 1 hole in the left foot is used to hold her to the base, so I have no idea where it came from (or why there are 3 extra holes). 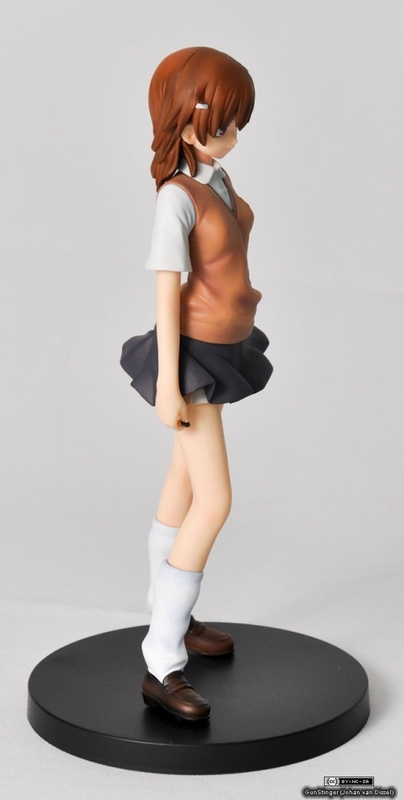 I don’t have pliers here, so I haven’t gotten it out yet, but if it’s not there (like with the second one of these I bought) her foot stays flat to the base. There’s a good amount of detail here – nice shading on the hair and a crisp and clean paintjob on the eyes. The eyes might actually be decals, but there’s a few things, like the translucency on the white specks near her pupils and slight irregularity of the pupils shape, that make me believe they are painted. The Tokiwadai emblem on her chest is hand-painted, and you can see some bleeding on the colours there, but it’s not very noticeable, or perhaps meant to be, considering there’s finer detail with the white-on-yellow part. The seems on her arms are well hidden, and all the interchangeable parts fit really tight, so you don’t have to worry about her falling apart. And yes, there’s a small blemish underneath the emblem, but that’s something I didn’t notice until I looked at the photos. One of the first things you will probably notice is the seam on her shorts. 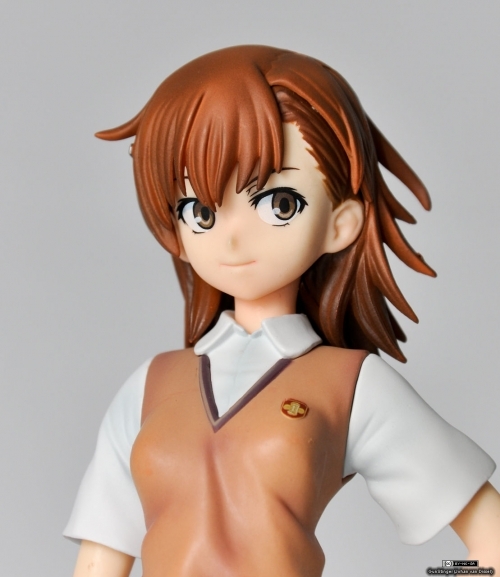 This is due to it being removable to change her into Misaka Imouto. This side actually fits together rather well, the other side slightly less so, as you will see in a bit. 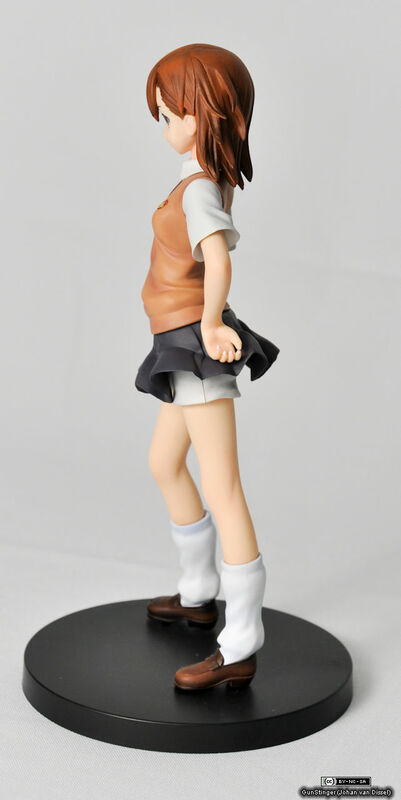 You can also see some of the detail on her socks and shoes; the shoes are very detailed, lots of blending between the shades of brown and fine sculpting. The socks have a little of shading, but mostly rely on the sculpting for the shades, which in real life works out better than with a flash lighting it up. Close-up of her left hand, showing of her pink nails. Unfortunately this isn’t as well painted – you can see the paint on her pinky bleeding onto the finger itself. I think you can also put a coin between her fingers here, but there’s a little bit of what’s probably paint between her thumb and index finger, and I didn’t want to force them apart, so I haven’t checked that. 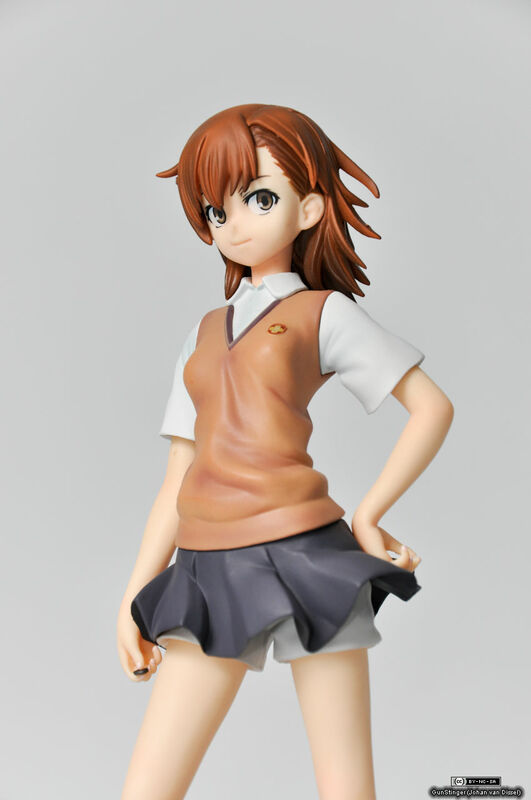 And here you can lament the fact Misaka had decided to wear shorts under her skirt. 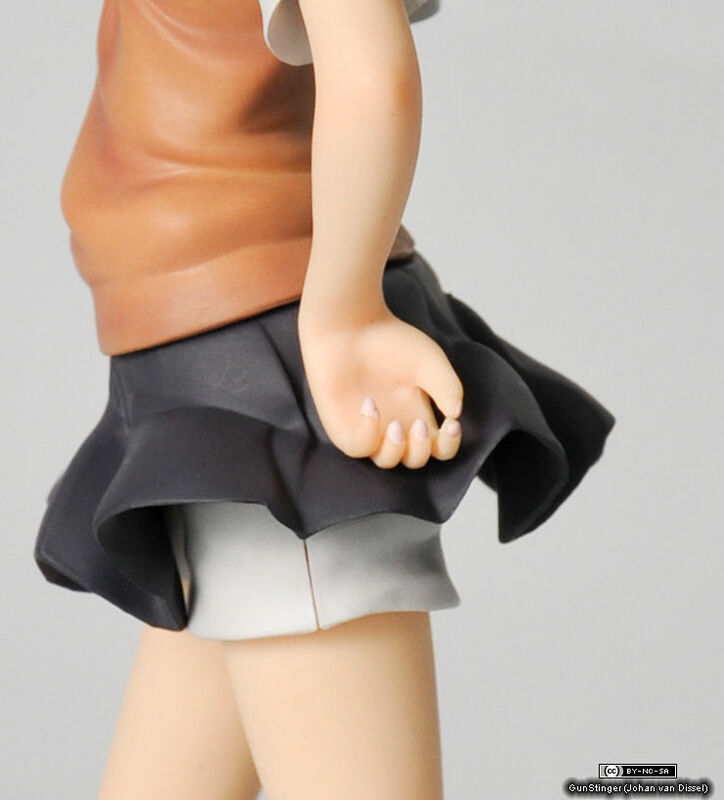 Nothing much to say about this side; she’s holding her coin with this hand, and you can see her shorts don’t really fit to well here. When I got her out of the box they fit together a little better, but I took her apart once or twice, so I probably didn’t push them back together far enough. A better view of the coin in her hand (and painted nails), and the seam. The marks on her skirt are there from handling and accentuated by the flash, I don’t see them under normal light. 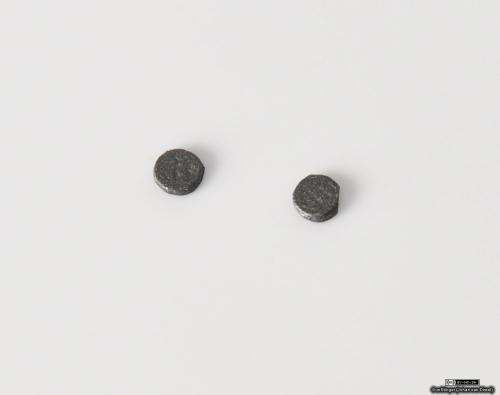 She came with 3 of these coins. They are really tiny, about 2 mm across, but actually have some detail sculpted into them; I haven’t been able to figured out what it’s actually supposed to say or show though. Overall I really like this figurine. It’s not as good as Good Smile Companies rendition, which has done a great job with her face, but with the otherwise very nice sculpting it takes second place in my Like-o-meter ™, ahead of Kotobukiyas version, which has given her a face like she’s about to kill a herd of innocent little lambs, and not even the superior sculpting and painting can make up for that. 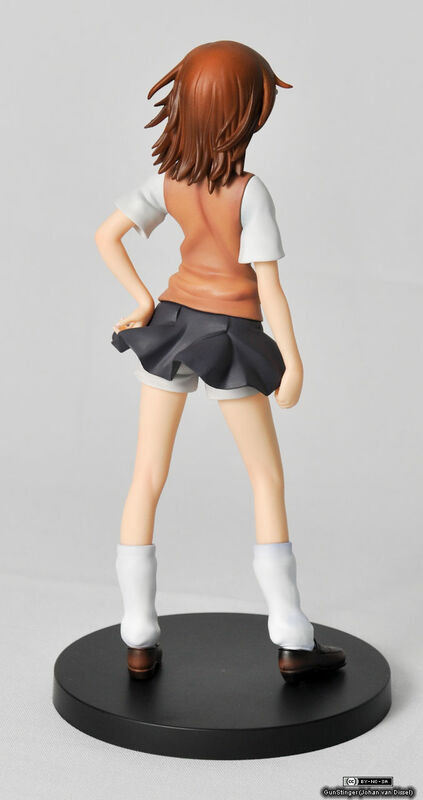 So there you have it, the first photo review of a figurine. I hope it was interesting; let me know in the comments if there are any mistakes or if there are any other things you’d like to see. This actually took a while longer to write than I expected, so I won’t be doing a triple bill with another review and a video-unboxing tonight as I planned, but instead I will post the unboxing tomorrow, and put up the other review on Tuesday. In the meantime, check out my other posts, or have a look at my (currently somewhat bare) YouTube channel.